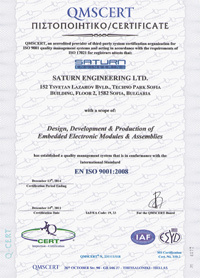 Saturn Engineering, Ltd. is a full service engineering design, product development and contract manufacturing company located in Sofia, Bulgaria. Since 1998 when we were established, we have become a successful extension to the engineering teams of many companies helping them to increase their profits and significantly reduce the time-to-market and the development cost. Saturn Engineering provides engineering services to our sister company, Ultraflex Power Technologies. Ultraflex offers the most advanced and innovative digitally controlled induction heating technology in the industry. The flexible output circuits and adaptive tuning power supplies feature the widest load matching and frequency ranges on the market, ensuring that our customers’ varying load conditions can be precisely matched to the equipment, which maximizes operating efficiency and minimizes process deviation. The Ultraflex Power Technologies product line is included below. For more information on an Ultraflex Power Technologies Induction System, contact us today! Our staff has extensive experience bringing new products from the initial concept to production. We have the advantage of providing technologically advanced and cost effective solutions by utilizing our talented engineers in our ISO 9001:2008 certified Design and Manufacturing facility in Sofia. Our team of world-class engineers and project managers includes experts in electronic design, mechanical design, embedded systems, firmware and software development.